Good News: Hunting safer than golf! NEWTOWN, Conn. -- Don't let anyone tell you otherwise: Hunting with firearms is safe; in fact, hunting with firearms is one of the safest recreational activities in America. Sauldam Baptist Church serenaded us tonight. Thanks! David Lawson, Sr. brought in a buck tonight! 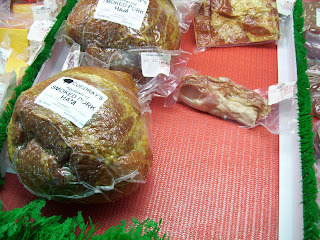 All the reserved applewood smoked pork hams are ready for your pick up! Open 9 to 9 through Friday. Closed Christmas Eve and Christmas Day. We have 2 sliced hams and 3 whole hams ready for sale in the case on a first come, first served basis in case you forgot to reserve yours! Michael Callegan brought in a nice one! George Beard picked up this monster European mount!